This lovely little bear is Bannock, one of our new Bread and Biscuits collection. 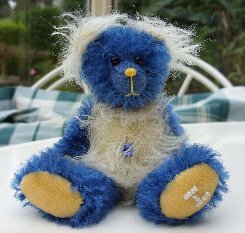 He is 5" tall and is made of deep blue tufted German mohair with his tummy and ears made of pale lemon mohair. This fur is quite sparse but curly and matted. We have given Bannock pale yellow cashmere pads and paws, a yellow stitched nose which we have varnished and shiny black German glass eyes. Bannock is steel shot and steel ball filled so he is nice and heavy for his size. He is a very cute little chap and I do hope that you like him. He costs £40 plus postage. Please note that as with all our bears, Bannock is not a toy and is not suitable for children.